*Projected by averaging first 72 games. That puts 2015 on track for a new record by 9,939 tickets. But, this isn’t a mathematical certainty. The Twins just need to find 10,200 more people per night than they found last night for each of the last 9 games of the 2015 regular season to avoid their continued streak of attendance declines. Or, if the Twins sold out the next 7 games, fans could take the last two games of the year off knowing that it’s only the second worth year for attendance at the latest publicly financed ballpark. At this point, there is a mathematical lock on this being either the worst or second worst season for attendance yet. Assuming attendance stays pretty much on track, here’s how the per ticket subsidies continue to grow. The fill it at 70% which is about in the middle in terms of attendance. It’s not how many fans you have, but how many fans you have relative to the capacity of the stadium that matters? That sounds like grade inflation, Rat. A smaller stadium by necessity means it would hold fewer people. The percentage of filled seats is a pretty important indicator. But this is all acadmic, and most related to the hardon you have for pro sports facilities, so you like to goad people with it. I took the bait. I have no one to blame but myself. 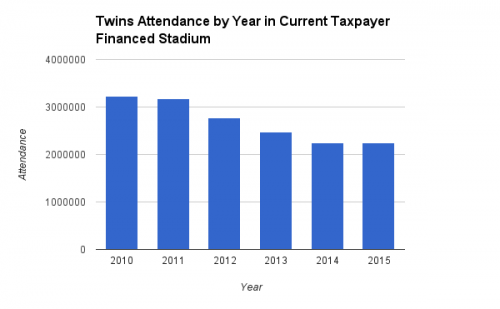 In a triumphant victory for Outdoor Baseball and Social Engineering, Twins fans have taken nearly 512,000 light rail rides, a 14 percent increase over last year. Yes, the size of the current ballpark is smaller than the Dome. 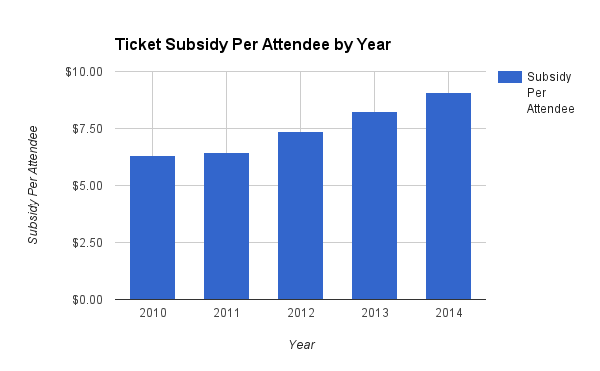 However, I’m not sure how that effects the annual decline in attendance every year the new stadium has been open. Were people tricked into taking a train to a station closer than they can park? The private market didn’t seem interested in paying for a parking ramp surrounding the stadium, considering that it wasn’t even willing to pay for the stadium itself.